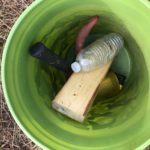 The Beginning – Farm Beginnings! 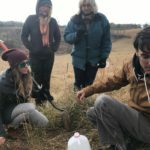 Along with the crisp fall air, October brought in OGS’ second year of Farm Beginnings, a year-long farmer training course for new & beginning farmers. We have settled into our new classroom at Southern Appalachian Highlands Conservancy’s incubator farm with 24 eager participants that represent 7 counties in Western NC, filling the room with ample questions and enthusiasm. Farm Beginnings is a national collaborative of nonprofits and farmer support organizations that have come together to develop a robust curriculum for new & beginning farmers interested in business & financial management; Organic Growers School has spent the last year developing this curriculum to fit the needs of beginning farmers in WNC. 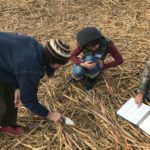 This year, Farm Beginnings became a FSA approved “educational vendor”, which means our participants will be able to claim this year as one year towards their federally-mandated three years of farm management needed to qualify for farming grants and loans. Organic Growers School is proud to be the only classroom-based FSA approved educational vendor in North Carolina. The students are pleased with their soil percolation test results. 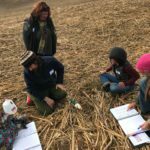 Farm Beginnings focuses on small-farm holistic planning, business and financial training, which is something we believe you just can’t learn out in the field. We rely on the seasoned farmers within our network to teach our students exactly what it is they need to know. 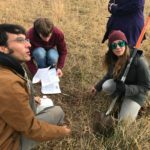 Along with classroom hours, the students’ tuition also covers participation in OGS’ Spring Conference, ASAP’s Business of Farming Conference, SAHC’s Field Days, and a year-long membership to CRAFT. 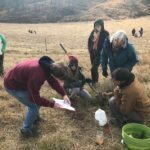 Class time thus far has been focused on excavating their personal motivations for wanting to farm and understanding their available resources and support networks, in addition to weighing the size of the farming operation they want to explore. This process will help them to define not only their business mission and vision, but will also incorporate their personal values and desires for the long term. All of this groundwork will be used to create their farm plan, to be turned in as their final project after the completion of the course. In true farm family fashion, every other class is a 5-hour session complete with a potluck that never fails to impress. From home-baked bread and kale chocolate chip cookies (!) to homemade salsa, farmer potlucks are not to be missed. 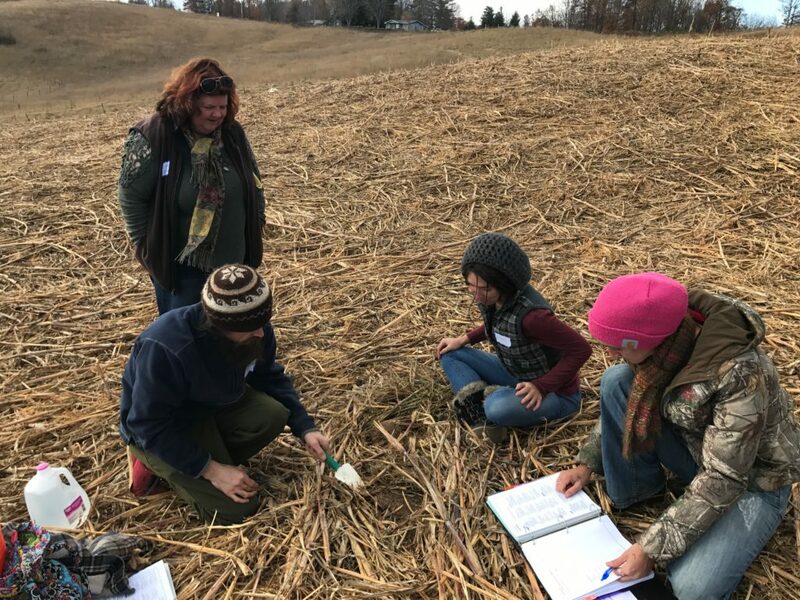 During our second Saturday session, taught by Laura Lengnick (previously the Sustainable Agriculture professor Warren Wilson who now runs her own consulting business, Cultivating Resilience), the students zoomed from the macrocosm of the food system to the microcosm that is the soil outside the classroom window. 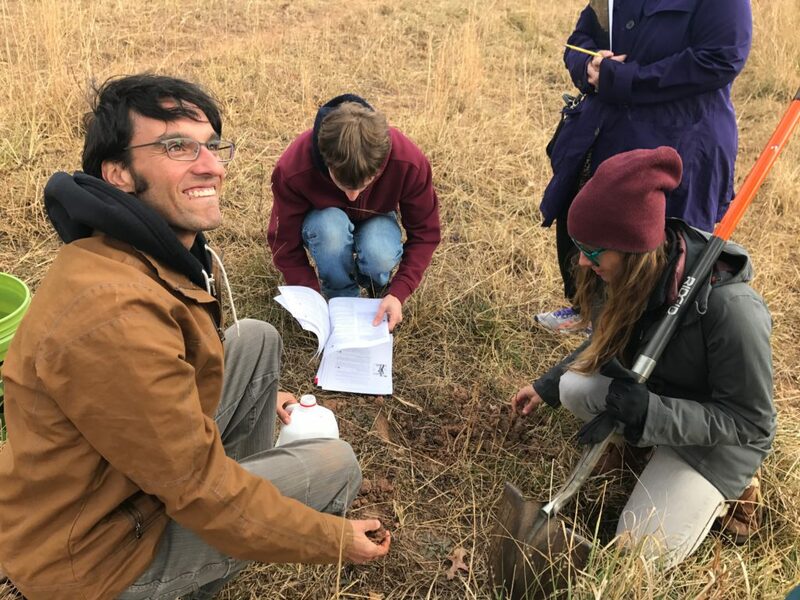 The soil monitoring tests the students performed around the SAHC Incubator Farm not only gave them hands-on experience in soil observation, but will also inform decisions made about soil treatments on this land in the future. 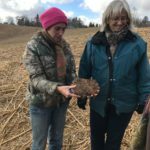 Future classes promise to bring in more rich discussion over the trials and tribulations of our food system, and what it means to be a sustainable farmer — financially, physically, and mentally — in this era. Want to get in on this deliciousness? 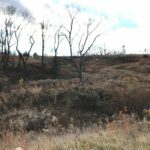 Consider applying to our next round of Farm Beginnings! Not ready to commit? Explore your options at our Farm Dream workshops coming up in February and April. Sera Deva has a B.S. in Microbiology & Agroecology from The Evergreen State College. She was hired at OGS as the Farmer Programs Associate in 2016, and as the Conference Coordinator in 2017. She has served on the board of the Southern Sustainable Agriculture Working Group (SSAWG) since January 2018. 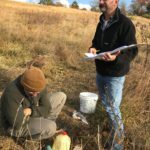 When she’s not geeking out over genetics, systems theory or soil hydrology, she spends her time working for farmers, homesteading, and river jumping in the South Toe Valley in Burnsville, NC.